With the following parts, including some aluminium and walnut I made an LED lighting fixture with a PWM dimmer switch. The code at the bottom will run on any arduino, although I used a 5 volt Adafruit trinket running at 8 mhz to control the switching on the transistor. It seems like it is more important than ever to be creative. Everyone wants to be seen as creative and most try to do all they can to encourage it. I am in the same boat. I need to be creative for my projects and videos, and it is a constant pressure to continue this, but while it is a pressure I think it is a great pressure to encourage learning. Learning is what I think is at the base of creativity, well that and practice. Those two things together, continued through life are at the heart of both happiness and success. Many people have come up with strategies to keep creative, and many books have been written to help with that, but I wanted to list a few things I think help creativity along. Before you can be creative you must have some knowledge though. Lets take toys for example. Most people like Lego, and most people think it has something to do with being creative, but what? If we make a bit of an algorithm, one that make creativity, than what do you need to be included in it? Lets say a tool, and the knowledge of how to use that tool is necessary to be creative. Well that is Lego in a nutshell. It is a tool, with very little learning required to get it going. Blocks just snap together, there is not a whole lot of learning necessary to use it. But learning and tools are just two of the things necessary to be creative. So lets put that in our algorithm, and figure out what else is needed for you to be creative with Lego. It seems like knowledge of the outside world is necessary too, otherwise you would just snap together pieces and make large walls that are not too useful to anyone. This is perhaps why this kind of toy comes with instructions about how to use it. The picture on the box is what most would make with it. If you compare this to woodworking, which is not so easy to do as snap together pieces of plastic, you realize that the more you know of the real world, and how people actually live, the more interesting and relevant your creations will be. So lets add a little bit of practical real-world experience to the algorithm. The real challenge to completing this algorithm of creativity is that you must continue to learn and refine your knowledge, practice with the tools and techniques, and that you are thinking in terms of the real world. I suppose it is also good to realize that it never stops, you are only as creative as your next idea. This is definitely a pressure, and many may not look at this as a good thing. Devising strategies to keep learning and practicing are really critical to continuing to be creative, because if it was easy everyone would be creative. In many ways, ever since I began woodworking seriously I have been wondering why there weren't more women involved in making things. I mean woodworking, but also building anything with metal, cnc and engineering too. I don't think it is a surprise to anyone that women are not generally associated with woodworking. I mean there are examples, but for the most part women are bunched in with the softer crafts like sewing, cooking and home décor. If instagram is any indication though, there are a lot of women giving woodworking and design a new life that is both nuanced and practical. I think the focus here in my mind is where are things going from here. I try not to pay too much attention to the past, I am future-oriented and am really excited to see where the new-found freedom in building, engineering and design goes. I come from one basic perspective, people behave based on what is around themselves. If you expose men and women, boys and girls to building many will be interested, if we do not then they are unlikely to think about it as a way to express themselves. I don't agree that we should accept the concept of gender-based behaviors as they are assumed to relate to woodworking and building. I believe things are learned, learned through our environments, and our environments are vast and complicated. Lets agree there is no “building gene”, and that lots of people would benefit from the experience and pleasure of building and woodworking, if only it was presented in a way to attract more interest. It seems like we often impose barriers to subjects on ourselves or others all the time. Many of these preferences are because of a wrong perspective, like that certain people can do math, and some cannot. Other subjects just seem more male, which can bar women from thinking about them as an option as well. It is more likely that these environments we either create ourselves or adopt from our families are just wrong. I believe that if you want to be a good example and encourage others to learn to express themselves in woodworking, making or even science you must watch out how you yourself believe about these subjects. You are really more of an influence on others than you realize. I have been thinking about the maker movement lately, where it started and where it is going. You frequently hear people talk about this subject, but I wanted to put a little different spin on it and look at it from a different point of view. Even though making is all the rage, and there are a lot of makers out there nowadays, where did they all come from? Did they not exist before this time? First of all I really think they have always been around, but lets start with a basic assumption. Making is fun, and making is good, and the more people learning and building the better. We all benefit from innovation and that is exactly what is coming out of the movement. So where did it begin? Well if we start at the beginning we have been making for millions of years, the birds may have built a few nests, but we have been building tools for more than 2 million years. So I think it is safe to say that it is in our culture and our DNA as much as anything can be. That seems to be the point, humans like to make things, we are active, bright and smart, and unlike other creatures on earth we are not satisfied to lie around on the grass and bask in the sun. I really love how active humans are and this new movement has some interesting characteristics that separate it from even the relatively recent movements related to human building and creativity. We are not the first to want a more genuine connection with our food, furniture or surroundings. As recently as the 1970's there were twenty and thirty-somethings who began to reject a mass-produced disposable lifestyle in favor of relearning values of the past, while others were very enthusiastic about the new possibilities in computers and electronics. So on one hand you have Alice Waters, Fine Woodworking and Roy Underhill, and on the other you have teenagers and twenty-somethings like Steve Wozniak ordering computer kits from magazines all over the world trying to build the first personal computer and push the boundaries of what was possible. This was making at its best, and this has only continued to the present. Those initial movements in the 1970's have really spread though. The idea of a greater personal connection to furniture and building and food has blossomed in people of all ages and skill levels, personalizing all the stuff around them. Lets not forget those initial computer tinkerers that have moved into bringing us Arduinos and Raspberry Pis, and the food deserts of the past have been replaced by the new farmers markets and organic fast-food. There are of course differences today. Learning has become cheaper, even though education has become more and more expensive, knowledge has become cheaper. The structure around us has changed dramatically, and communication, mostly due to the web, smart phones and YouTube almost forces us to be makers. Sometimes this is just to keep up, sometimes it is because we must rely on ourselves, and sometimes we realize everyone else has become both a teacher and a competitor. Teaching has become so distributed that we are all both learners and teachers. Every blog post, video, or even tweet adds to the general knowledge which we all now have access to. In the past knowledge was much more difficult to come by, so it was cloistered in associations, universities, trades and the like. Those keepers of knowledge often made it difficult for knowledge to come out into the open. But that is where it is now. That is why it is a revolution. Never before have the tools been cheaper and the knowledge been more available. Not that everyone is equally enthusiastic. You can always detect this unhappiness when you hear about how experience is so important. If there is a danger to the maker movement, it is some kind of over-arching regulation that tries to institutionalize knowledge, but as long as we keep it free, there will be makers. I have been referring to the innovation-related maker movement, but it is certainly broader than that. People don't just make things to innovate, they do so to save money, make money, express themselves, feel a sense of control over their environment and a lot of other reasons. I'll leave all that for another time, for now it seems to me that the future for this revolution looks bright and I am happy to be a part of it. This will be the topic of my next Podcast, so let me know your thoughts. Organizing spaces can be daunting for some, and a thrill for others. I love an organized shop. I am the type who needs to see what they have on the walls, or be able to have memorized every single item in a few specific important drawers. Some people hates shelves, some dislike drawers, I fall into the middle somewhere and try to look at the overall environment more than one specific type of organization. I guess the first thing I think about is getting a basic overview of your tools and supplies. Generally I look at it this way, have I used that tool, or supply in the last year? This goes for any tool, like an old drill, or any scrap wood or paint that has not been used in quite a while. Most of my initial organization centers on how often I need that thing. I like to keep my most important and often used tools right near me, usually out in the open. This includes many of my hand tools like chisels, planes and rulers. I also love to have one go-to drawer that has many small tools like utility knives, small screw drivers, measuring tapes...etc. You can see in my shop that I have exactly this setup with a wall of tools right behind my main workbench and a set of 10 drawers below that. I am always rearranging what is in some of these drawers to account for how to better use the space, but the main smaller ones I keep the same over time. I have tried to organize my shop into little zones or areas. The first thing I designed and created was the main workbench with the tool wall and counter/drawers behind it. This is the most important area because I stand there all the time. The second most important area is the computer area with the desk and printer. While many people do not have a computer area in their shop I find it to be space put to good use. Besides designing projects on paper as well as on the computer, the x-carve needs a computer connection to operate so it has become a vital part of the shop. Another important but overlooked point is that this is a business and you need to keep contacts and company information somewhere that you can work throughout the day, so the printer and file cabinet is quite important for that type of organization. Those two areas are the most important in my shop and were designed right off the bat. Other areas such as my new tinker area have developed over time, and are still in development. Even though my shop is very small at 12 x 16 feet I can think about it in zones to make the most out of the space. My new french cleat organization wall over the drill press bench is a good example of that. In the last year that area has changed numerous times. First I added the bench for the drill press earlier this year that had a bandsaw, then I moved out the bandsaw...you just never know what you will have to work with. Each of the previous incarnations were never considered permanent, because I know that you have to be flexible and be ready to accommodate new tools and orientations if you want to be effective. Even my overhead camera rig has been changing locations recently. At this point it is on the tinker table because the x-carve is using my former photography table, so you just never know. It may not seem like it but in this small space I have 7 horizontal surfaces, made up of tables, benches and counters that all form these little nooks of specific tools and supplies. One of the things I keep in mind is that your environment affects you. And that can be both positively and negatively. So I will undoubtedly be changing things once again as the need arises. It seems like I am always trying to add more to my shop, and that means if one new thing comes in, I need to get rid of something else I no longer use. A well-used shop is an constant flux and I expect more changes over the next year. French cleats are an incredibly easy and beautiful way to organize any space. This time it is my shop, but I can see how useful they could be in a kitchen, bathroom or craft room. In my mind it is all about how things look. I like to be around clean, nice looking environments, usually with white integrated as a background. Wood, light-colored wood especially can be overpowering to the eye. Of course walnut, or an exotic wood presents exceptions, but generally pine and framing lumber can be a bit over-the-top if used too much. In this project here I wanted to have the pine screw organizer in focus, while popping off a white background. It is often curious that people who film and photograph their projects do not have white walls in their shop since it reflects light better than anything else. With the flexibility of the wall system itself not a problem, the real question is what type of storage to make for the wall. Since you can add a simple 45 degree piece of wood to any box, shelf, or cabinet you can create just about anything. The joint is also really strong and finding studs is no longer a problem so you can really let your imagination go wild. In my project I needed to store staples, small hand-held tools, glue and a shop vac so the shelves and boxes I made had that focus in mind. I will likely make a few more specialized boxes or shelves over time as I add and take away a few things but for the most part it is pretty well in place. I think I may have a future project in mind for the kitchen/pantry that will use cedar and ipe to do the same type of thing, expect that all the bottles of olive oil, vinegar and spices I have may finally have a home. To celebrate that I've hit 20,000 subscribers on YouTube I'm having a mallet giveaway! I've been on YouTube a little over a year now and I'm so excited to reach this level with my channel. As a way to say thank you, I want to give away one of my hand crafted mallets. 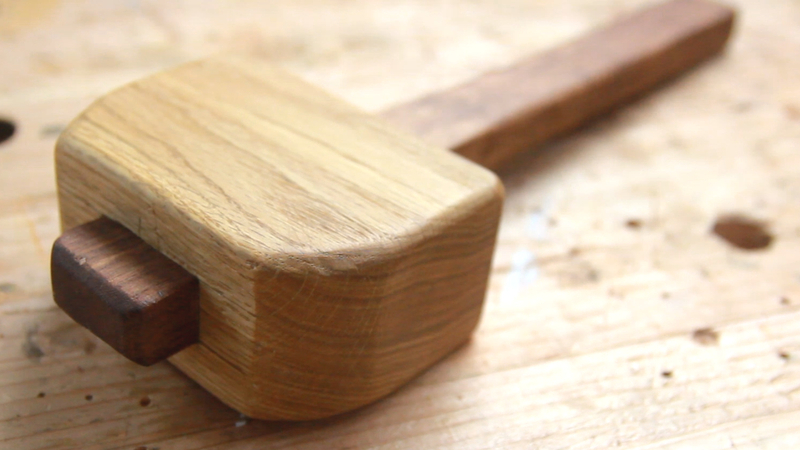 This is a medium sized mallet (perfect for just about any task) and it's made with an oak head and an ipe handle. To enter the giveaway, please subscribe to my weekly newsletter, and make sure you're subscribed to my 2nd channel DarbinNotes. I will contact the winner by email on May 28th. This giveaway is open to the whole world. Newsletter - Overhead Camera Rig, Popular Mechanics & Giveaway! How are things? Everything is going well here in the shop. I'm working on a couple of new video concepts and projects, and trying to perfect my editing too which is always interesting. 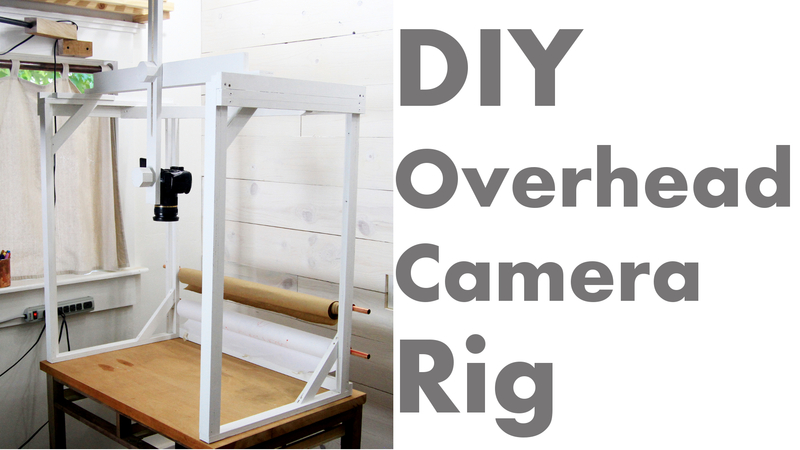 Did you get a chance to check out my latest video - DIY Overhead Camera Rig? This is one of those projects that I've been meaning to make for a long time. Anyone who has ever tried to get overhead shots using a tripod knows how annoying it can be, so this set up makes it a lot easier to comfortably write and record, set up time-lapses and just photograph things from an overhead point of view. In terms of the editing on this one, I really wanted to go very pure and simple, with instructions and no nonsense. I think it came out good, and it was featured on Instructables homepage as well as on Popular Mechanics, so that was pretty cool. I've been on YouTube a little over a year now and I'm just about to hit 20,000 subscribers! I'm quite excited about this and to celebrate I'm going to be hosting a giveaway with one of my mallets. In order to enter the giveaway, I'm asking to subscribe to this newsletter (which YOU already are!) and to make sure you're subscribed to Darbin Notes. So if you want a chance to win one of my mallets, just make sure you're also subscribed to my second channel. I will have a video out soon about this, so this is just a little update on what's to come. 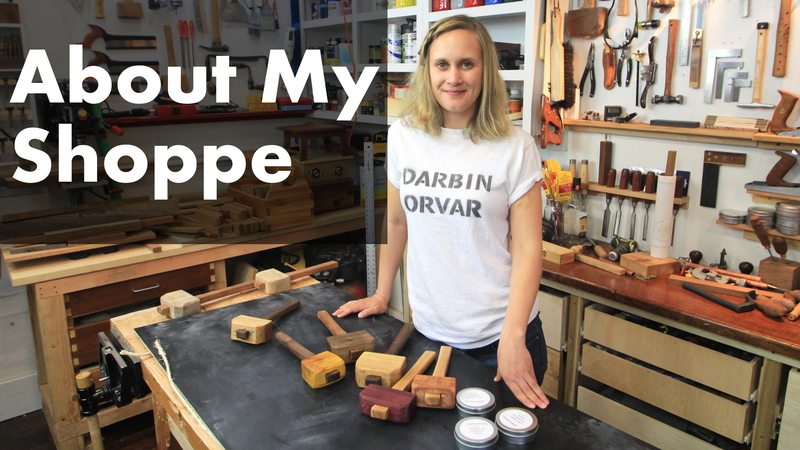 Newsletter - Chopping, Experiments, Patreon & Mallets! This is my weekly newsletter, if you want it to be sent to your email please subscribe to the newsletter. I hope everything is well. 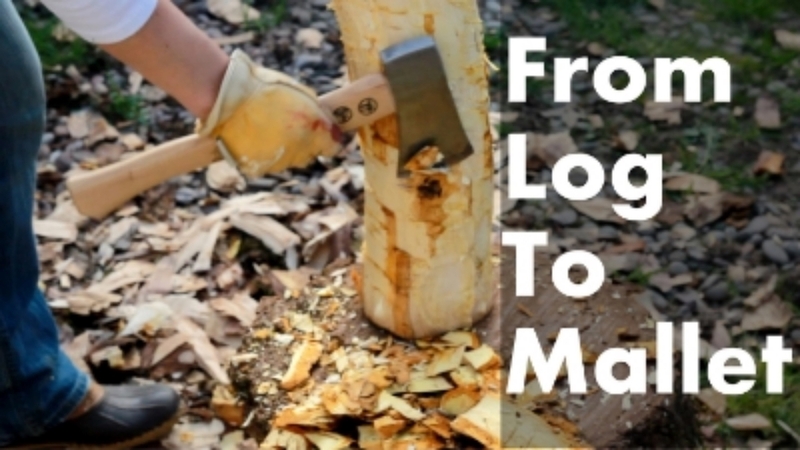 In today's newsletter I'd like to go over a couple of things which I've been working on, first of which is related to turning and bushcraft. Some friends had a black walnut tree cut down in their backyard, and they asked if I wanted to come and pick some up so I brought a few logs back. With one of the logs I decided to use my new lathe and make a round mallet! In order to fit it on the lathe I had to trim it down with a small ax and a spoke shave. I'd love to hear your thoughts on the video and the style. I've been continuing my experiments on Darbin Notes. Can You Mix Oil & Water Based Paint? So what's the verdict? Well, check out the video to find out. I do this full time, so your support means a lot to me. I want to really thank my Patrons today because I hit $100! That's so cool and I really appreciate it. If you'd like to support what I do, then please check out my Patreon page and consider becoming a Patron for exclusive videos and inside info! I've been working on a couple of new mallets and they're now in the shoppe. I've got a nice little selection of mallets made with oak, purple heart and walnut! In terms of sizes, I've been making a few medium and a few small ones which I really believe are the perfect maker size, ideal for almost any task. After having numerous people asking me if I had any food grade wax polishes, I decided I should add some to my shop. Now, while you could use wax polish made with raw linseed oil (not boiled), or tung oil on cutting boards, they do both have a distinctive smell that could possibly impart a slight scent to your food. Also, they both are curing oils, which means they dry and a film is created which creates a finish, however slight. While it is ideal to use a curing oil for wood finishing projects, it's not ideal for cutting boards and cooking utensils. For those objects, you really want to use a non-curing oil such as mineral oil. For this batch of cutting board wax finishes, I used 100% food grade mineral oil from General Finishes, and 100% natural beeswax. The mineral oil imparts no color, and neither does the wax to the wood, so all the color of the polish comes from the beeswax. The polish has a very nice honey-like color and has a great consistency, making it easy to work with. While this polish is great to use on any kitchen tools, it's also ideal to use on metal in the shop where you don't want a film to build, such as on your hand saw blades, cast iron, table saw tops etc.. Applying a coat of non-curing beeswax polish every few weeks on these objects will protect them and keep them in great shape. Does Oil Impart Color to Wood? I wanted to show that the oil does not impart any color to the wood. I put on some of the tung oil wax as well as the linseed oil wax on both the fir and the redwood above. Even though the light in the photo makes it look as if the left side is a touch darker, there is actually no difference at all. So, there is no reason to be concerned about any color differences imparted to the wood, even though the oils have a different color to begin with, and the wax also doesn't give any additional color. Anyone who has watched my many videos has likely seen a time or two where I bring out the wax polish after I put on a top coat of poly or shellac, and sometimes even instead of any other finish. I hope you have also seen my Wax Hacks video where I show just how versatile the stuff can be. I think most people really like the fire starters, which I was also able to use on a few Halloween pumpkins.